No matter where you look, artificial intelligence is changing the way we live our lives and do business in the world today. This is especially true in the world of email marketing. Just think about how archaic the concept is of email marketing today. Usually, it will go something like this. While it’s simple in its form, it’s still a little silly when you look at how marketing automation and how everything else is done on the internet today. It’s even worse if you factor in that millions of people are still just sending out emails to millions of subscribers and not using any segmenting, demographic targeting, or remarketing in the process. This is just leaving money on the table, and not providing your subscribers with the best value possible in the process. With so many different methods out there for learning more about your audience and targeting them based on their interests and on-site experience, you should be able to make your email marketing do the same. This is where the future of AI will change everything. Not just how we manage our email subscribers and data, but also the management and sending in itself. 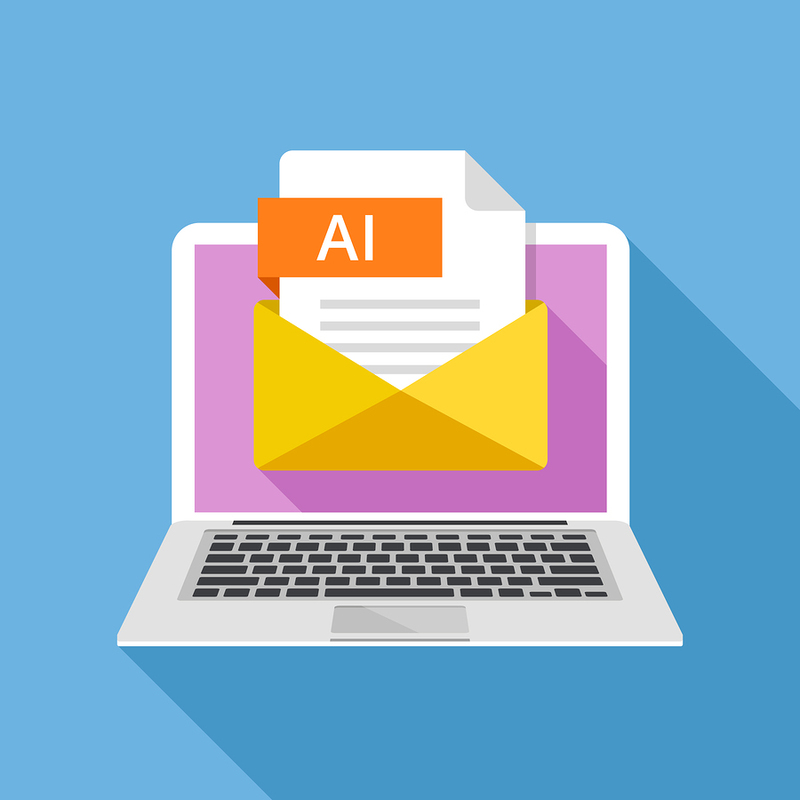 Today we are going to take a look at some of the most exciting developments in the world of artificial intelligence and email marketing, while also highlighting the potential opportunities to implement AI into your existing business or marketing efforts. One of the biggest components of email marketing is manual outreach. Then when it comes to manual outreach, this is usually in the form of trying to get publicity or connecting with another website or blog. In this article featured on Forbes, the writer created a fake artificial intelligence based website that would allow users to get free press by contacting a wide range of media outlets and writers around the world with the click of a button — which already sounds too good to be true. Even though the concept of manual outreach in an effort to get free exposure is nothing new, the writer found a ton of interest from audiences who are willing to sign up for the service. Which they weren’t too thrilled about. While this might not be artificial intelligence in motion, it is a glimpse of what’s potentially to come. Manual outreach has quickly and effectively been optimized to become more of an automated process where you can upload data and have a mailing platform do the work for you. How soon before we see an advanced AI platform that can do such manual outreach for us while also looking completely legitimate in the process? Will AI leave email marketers without a job? There is no doubt that automation and artificial intelligence is already making huge waves in the world of retail shopping and causing many workers to find new jobs. There is simply no longer a need to hire so many people to complete simple tasks, such as cashiers, collecting cards, and data entry. Artificial intelligence and automation are learning and growing at a faster pace than ever before. Now the question is, will artificial intelligence wipe out the need to ever hire a social media manager or even an email marketing team? That is what this article in VentureBeat asks — “Can AI leave email marketers without a job?”. Just look at the numbers. Global marketing automation is set to expand from US$4 billion in 2017 to US$7.63 billion in 2025. Of this, global email marketing alone will account for US$2.29 billion by 2025. Why is the demand so high? If you look closely at business owners’ routines, you’ll notice a constant lack of time, resources, and marketing skills. The true takeaway here is that email marketing is going to be run by artificial intelligence in only a matter of time. However, there will still need to be manual processes in place to not only set up such features, but also to make sure the platforms are working and to teach the platform how to work in the first place. With that being said, if you are currently an email marketer or hired as an email manager… you might want to be thinking about the future. While the topic of artificial intelligence is going to continue to be a discussion for years to come, it will still be a while before many businesses adapt the process or even begin to touch it. With that being said, it’s important to still look at your business as a whole and how you can continually grow it on a daily basis. Here at AfterOffers.com, we are committed to helping businesses and brands of all sizes grow their mailing list with only the highest quality leads possible. Through our innovative software and advertising platform, we connect with some of the highest quality websites on the internet today, while also offering opt-in email experiences to grow your mailing list. To learn more about how automation and our opt-in lead generation platform can help grow your business, be sure to contact us today.